Professors Andrew DeCaen and Cynthia Mohr will be co-leading a Study Abroad program in Italy this summer. Please share this email with your students! Sketching/Journaling: Continue your creative practice as a traveler and while expanding your global perspective. Daily routine will include morning sketching experiences using the broad environs of the city as source material and early evening meetings to discuss journal progress. School facilities will support the development of journals. Figure Drawing (beginning to advanced). 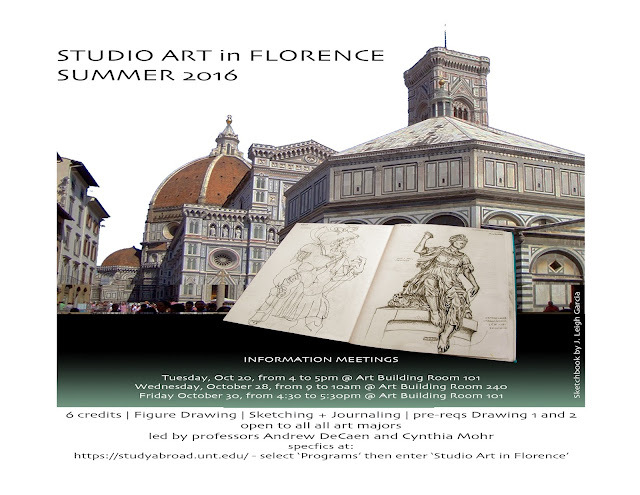 Refine your figure drawing experience in the city that is the cradle of the Renaissance. Daily routine will include morning drawing on location at museums and many public spaces around the city, and early evening figure drawing sessions at the Santa Reparata International School of Art Studios.